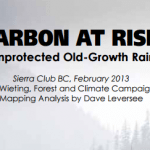 This piece by Dr. Colin Campbell, former Sierra Club BC Science Advisor, was originally published November 05, 2013 in the Tyee. At every media opportunity, Premier Christy Clark has been touting the development of a “clean and green” liquified natural gas (LNG) industry. Her government’s messages suggest that LNG production has little environmental impact and provides a clean energy alternative with very low carbon emissions. These claims simply do not add up. Natural gas is a fossil fuel and burning it releases carbon emissions. We cannot discount these emissions because they will be burned in a different jurisdiction. Additionally, 85 per cent of B.C.’s natural gas is now extracted through hydraulic fracturing or “fracking,” a process that requires massive water resources and contaminates groundwater, affecting the quality of life for humans and the rest of nature. Another extremely important factor which LNG proponents largely ignore is the high level of methane that LNG production releases. Methane, CH4, is a potent greenhouse gas in its own right and large amounts are released during the mining, transportation, storage and distribution processes. Because we account for all our greenhouse gases in terms of carbon dioxide, the emissions of other greenhouse gases, including methane, are calculated as equivalents of CO2 using a conversion factor called Global Warming Potential (GWP). The GWP for methane (the primary constituent of natural gas) has been increased based on the scientific findings assessed in the recent report by the Intergovernmental Panel on Climate Change. For methane, over a 20-year time span, this factor has been recalculated from 72 to 84-86 (i.e. one tonne of methane has a warming effect equivalent to 84-86 tonnes of carbon dioxide). Over 100 years, the factor is 28-34, because CH4 breaks down to carbon dioxide and water over time. But since we are already perilously close to exceeding dangerous levels of greenhouse gases in our atmosphere, the fact that one tonne of methane has a warming effect equal to 86 tonnes of carbon dioxide over a 20-year time span should be front and centre in assessing the climate impact of LNG development. Not only is methane a more powerful greenhouse gas than previously assumed, its leakage rates, especially in fracking fields, are much higher than those used in emissions calculations — indeed high enough to eliminate the supposed climate advantage methane has over coal as an energy source when leakage is not adequately considered. B.C. hugely underestimates its current and projected methane emissions. In 2010, B.C. produced 36.4 billion cubic metres (m³) of methane as natural gas, claiming that only 0.3 to 0.4 per cent leaked into the atmosphere. However, comparable U.S. studies suggest four to nine per cent is a far more realistic estimate of methane leakage. Even if B.C.’s methane emissions were below this range — for example, three per cent instead of 0.3 per cent — there would be 1.1 billion m³ of methane released into the atmosphere every year instead of 110 million m³. On a 20-year timescale, this equates to 66 million tonnes of CO2 per year (see calculation below), more than doubling the official 2010 estimate of total carbon emissions of 62 million tonnes carbon dioxide equivalent. 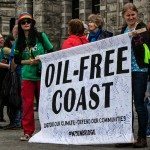 An upfront accounting of B.C.’s total carbon footprint clearly reveals that the construction of a natural gas industry with its inevitable leakage of methane, as well as the burning of the product, would make it impossible for B.C. to meet its legal obligation to reduce greenhouse gas emissions by 33 per cent below its 2007 levels by the year 2020. Intentionally promoting and pursuing such activities is not only questionable in terms of provincial law, it undermines our remaining fighting chances to come to terms with a global plan to tackle emissions. The increasing likelihood of stark future carbon pricing means it is probably an economic disaster-in-the-making as well. Instead, B.C. must face the realities of climate change head-on, tackling the challenge of reducing our energy needs while developing alternative energy technologies. Pursuing an LNG industry is folly of the highest kind, given the warnings we have as to where climate is heading.